Wedding season is now in full swing and if you're anything like me, you've probably left gift buying to the last minute. And now the only thing left on the list is vouchers. Now, some people don't like to go off piste, but if you would like to give a thoughtful gift alongside the obligatory vouchers, this week's Wednesday Wants is all about wedding gifts that'll give them something to remember their big day by. Because let's face it, no one looks at a Dualit toaster and thinks fondly of their wedding. Firstly, why not give them a special way to remember their wedding venue with a personalised illustration from Letterfest (£38 from Notonthehighstreet). Or if you know where they first met, how about this personalised heart shaped map by Bombus off the Peg (£42 from Notonthehighstreet). Or (for the right wedding) you could help out with stressful decorations by having beautiful bunting made with their names on. They can hang it in the garden afterwards as a permanent reminder. Make it yourself or buy it for £37 from Johnny's Sister (Notonthehighstreet). For a little bit of humour, I love this Ros Shiers print (£25 from Rockett St. George). 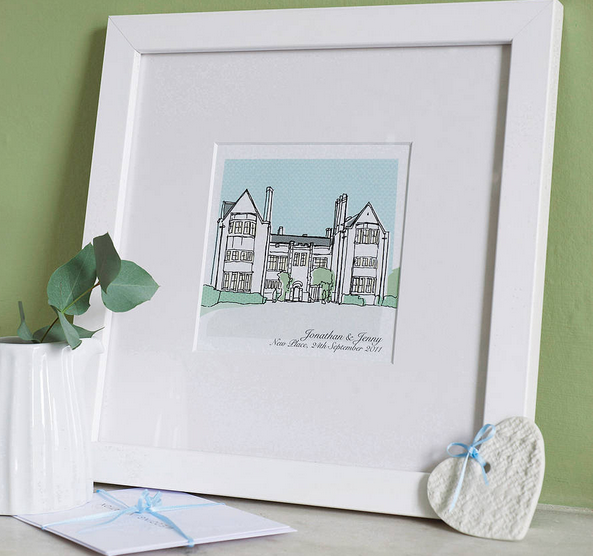 If you've found any marvellous wedding gifts, do share here (for us last minute buyers, ahem).